Quartz, marble, granite, laminate, tile, and even lava and recycled glass – there’s no shortage of bathroom countertop materials to choose from. Which is the best choice for your bathroom remodel? The one that look greats and gives you the practical benefits you need! You’ll be happy to know that some of the most beautiful countertops are also the most practical, though some are less forgiving than others. If you’re gearing up for a bathroom remodel in your Tallahassee area home, here’s what to think about when choosing countertops. Asking what’s the best countertop surface for a bathroom is a bit like asking what the best restaurant in your area is. There are always a few that stand out but the best one comes down to personal preference. Our Two Favorite Bathroom Countertop materials for a bathroom are Quartz and Corian. Quartz is a man made stone that comes in a wide variety of colors and is very durable. Corian is a solid surface material that also comes in a wide variety of colors and costs about 25 percent less than quartz. Corian does scratch more easily than quartz but in a bathroom that is not usually a big issue. Cost: Laminate countertops are your most economical options. Corian is a good mid range cost option and Quartz or other stones are at the higher end of the price range. 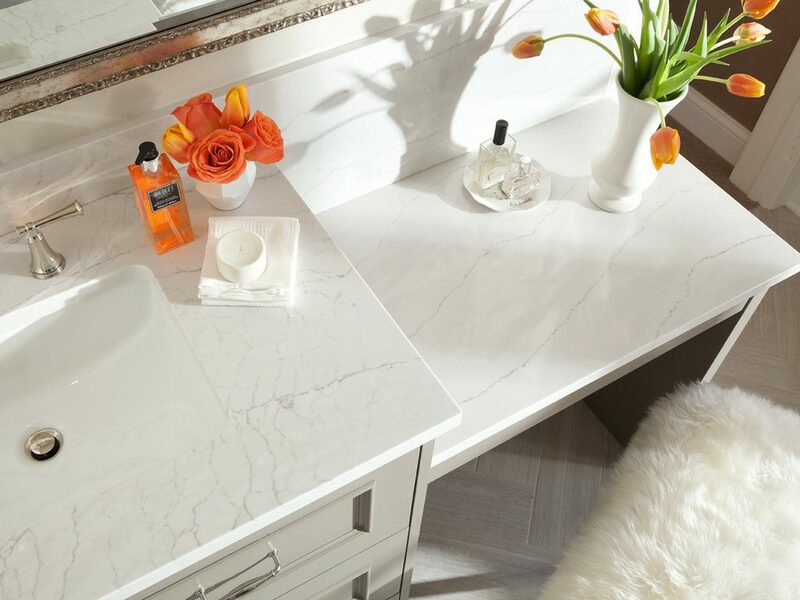 Durability: Marble countertops are gorgeous, but marble is a soft stone that stains and chips easily and may not be the best choice for a bathroom used by teenage girls (unless you happen to be an Arab sheik or the President of Turkmenistan, in that case, go for it!). 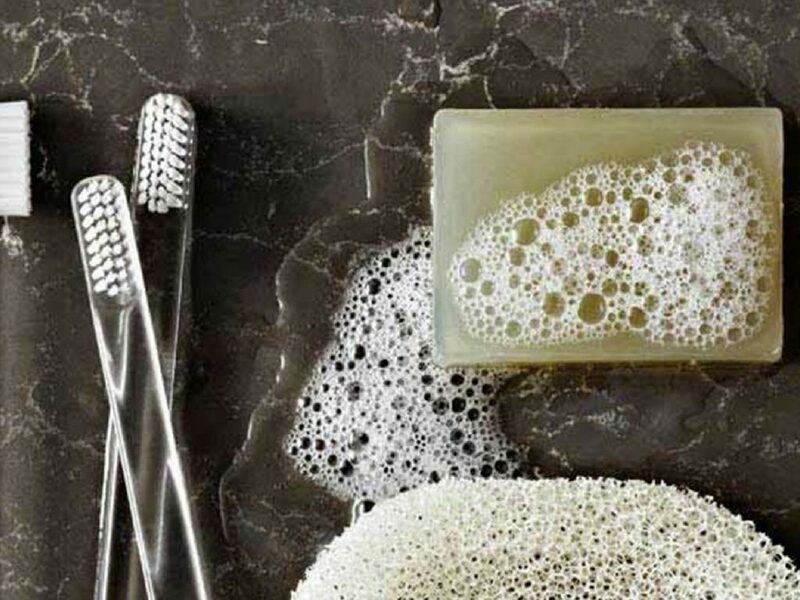 Bathroom countertops are exposed to all sorts of substances: toothpaste, hairspray, makeup, and creams and lotions. You want a countertop that is compatible with how the room will be used. All three surface listed above (laminate, Corian and Quartz) are very durable with Quartz probably being the most durable of the three. Style: The color and style options are almost unlimited these days. Aside from the many colors of quartz, laminate or corian available you can also choose from more exotic materials like lava stone, recycled glass, wood, cement or sintered stone. Laminate in the kids bath. Laminate is inexpensive and takes a beating well. Modern laminates come in all kinds of great colors and styles. If your kids’ bath doubles as a guest bath, you may want to consider an upgrade to corian or quartz. 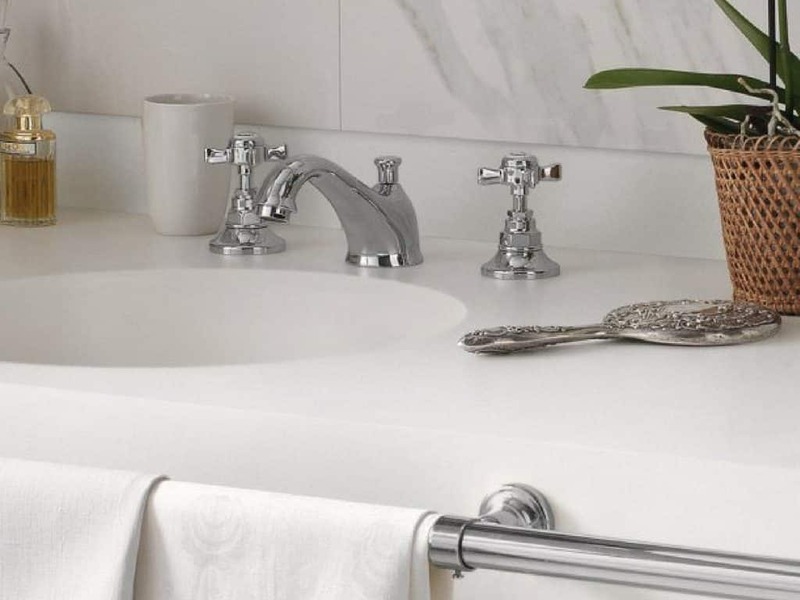 Corian is our go-to countertop for most bathrooms. People love the built- in sinks that can be installed with Corian tops, and it costs less than quartz but has a similar look and feel. Corian can also be repolished by a professional for a small fee (well worth the expense every 3-5 years). Quartz, recycled glass, lava stone, and granite are great options if you have the budget and really want something special in your bathroom. Nothing compares to a real marble top for its beauty and soft texture. But marble is not very practical as it stains and chips easily. Since marble is a natural stone, the color and veining can vary a lot. Be sure and pick your exact slab from a stone yard. High quality white marble is harder and harder to get, most marble we see these days has more of a grey hue. Wood countertops are surprisingly resilient in wet areas if treated properly. Still we generally only recommend them for powder rooms or laundry rooms. Wood countertops are also a great addition to your kitchen. For the budget conscious there is a new product on the market called an “All-in-One” vanity. An all in one consists of a vanity, countertop, sink and matching mirror all delivered in one box, ready to install. They can be a great option for your bathroom. The downside is they only come in a few styles and colors so you can’t personalize your bathroom quite as much. All in One vanities are a great choice if you’re trying to spruce up your bathroom to get ready to sell. More foot traffic typically means more chaos and clutter. Does your design call for a custom installed countertop, or just a top for a small vanity? Are you remodeling the bathroom for resale? If so, get something that looks good, but is more practical in terms of budget. Laminate and tile are two good choices. If the upgrade is for you, don’t hesitate to splurge on what you really want. Are you interested in eco-friendly materials? There are countertops available that are made from recycled content. Our designer will discuss your options. Quality countertops and cabinets are expensive. But countertops can be replaced fairly easily, whereas cabinets cannot. If you’re struggling to keep your project on budget invest in quality cabinets and use a lower cost counter. You can always upgrade the counter top later. This is also a great option for bathrooms used by young children. Install a low-cost countertop while they are young and then upgrade when they are older and will take better care of their bathroom. Probably the biggest dilemma you’ll face in choosing a material is narrowing down all the options. Everyone’s personal taste and style is different, but here are what we consider the top three choices for bathroom remodels. Our two favorites are quartz and Corian. Quartz Bathroom Countertops. Sometimes called engineered stone, quartz countertops contain ground quartz held together with a binder. Premium quartz from companies like Cambria and Silestone are made up of 93% stone and 7% resin binders. Less expensive quartz can contain up to 50 percent resins and we don’t recommend them. Quartz countertops come in a wide range of beautiful colors as well as patterns that look like granite and marble. And because they are non-porous, they’re stain-resistant and easy-to-clean. Quartz should not be used outside as the UV rays will break down the resins. Solid Surface Bathroom Countertops. Made from synthetic materials solid surface countertops are manufactured in a variety of styles and colors. DuPont’s Corian line has the greatest name-brand recognition for solid surfaces. There are a lot of good reasons for choosing Corian: it’s durable, non-porous, seamless, repairable, and simple to clean. And it comes in an incredible range of colors. The drawbacks to solid surfaces is they are not as heat-resistant as other materials, and they can be more easily scratched. 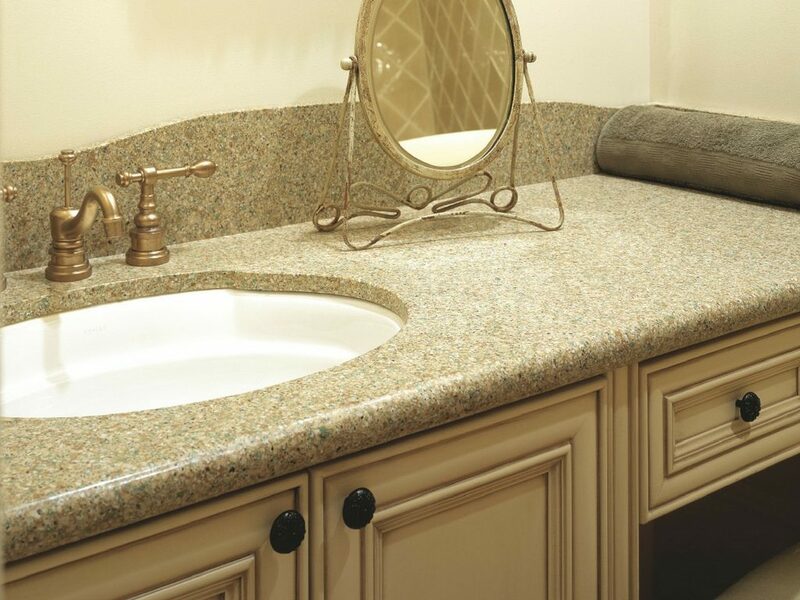 Granite Bathroom Countertops. For an upscale look that is beautiful and elegant, nothing beats granite. Their classic good looks, durability, and heat resistance make them a favorite for many homeowners. But the disadvantages often overrule the advantages. They need to be regularly sealed, are prone to chips if hard or heavy objects are dropped on them, and easily stain if the sealer fails. Professional grade products are usually required for cleaning, polishing, and stain removal. McManus Kitchen and Bath specializes in bathroom remodels, which means we know a lot about countertops! Need some help in choosing the right ones for your remodel? Visit our showroom. We have all the latest information you need to make the right decision! To learn more about all your bathroom countertops options, or to talk about any home remodeling project, drop us a line today. We look forward to meeting with you!